For years I pined after a blow torch. I was convinced it was the tool holding me back from making homemade delicious crème brûlée. Nevermind the fact that there’s a workaround for this (found at the end of the recipe) but I longed for the blow torch all the same. I remember my excitement finding one in Montreal while on a girls trip and hoping it wouldn’t get confiscated from my suitcase on the way back to France by way of Vancouver. Thankfully it survived the travel and my tastebuds have not regretted the purchase. Also, it feels kind of awesome to pull out a blowtorch in the kitchen… anyone else with me here? 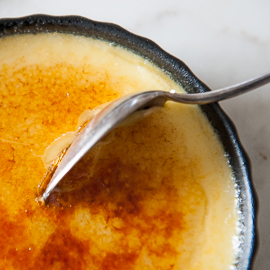 It’s been a few weeks now where I just keep thinking about how I want crème brûlée, and no, I can’t even blame it on being pregnant, it is just a favourite. 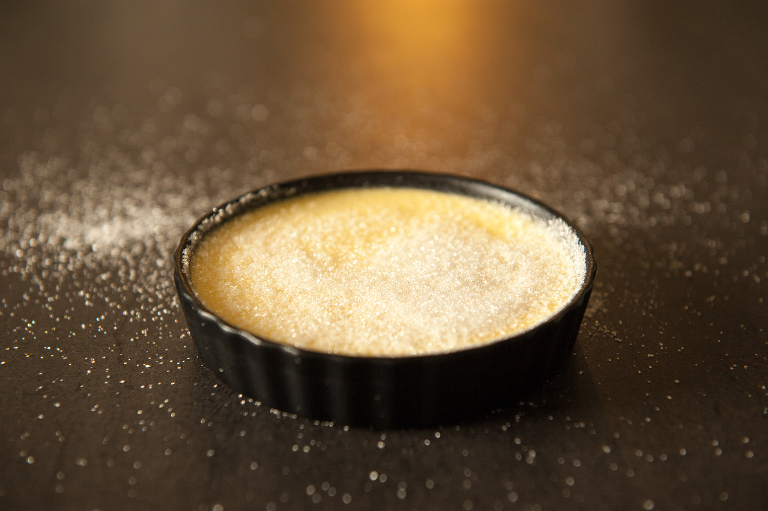 Even a couple nights ago while we were in Fontainebleau for dinner we’d just finished our meal and the waiter brought a small tray showing us the various desserts available and there is was, crème brûlée. 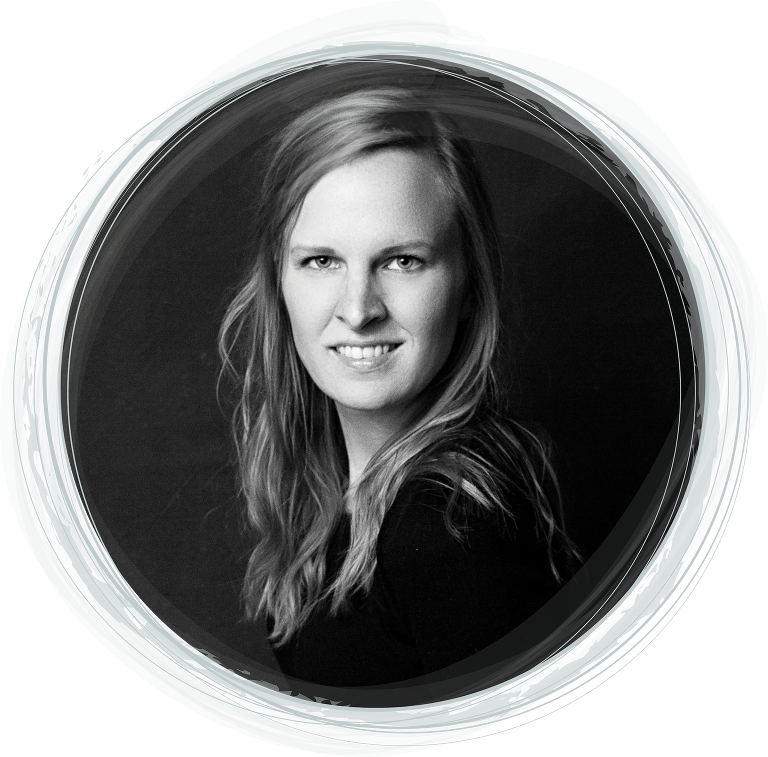 While it was tempting to say yes, my stomach had already told me to stop and I’m always a little apprehensive about restaurant versions as they can be too heavy or too sweet. So this week I finally decided to get to work and make some at home. Usually, I opt for a simple vanilla bean version but today, I felt inspired to make one with some coconut milk! Time to pull out your ramekins (gratin dishes) and get to work! 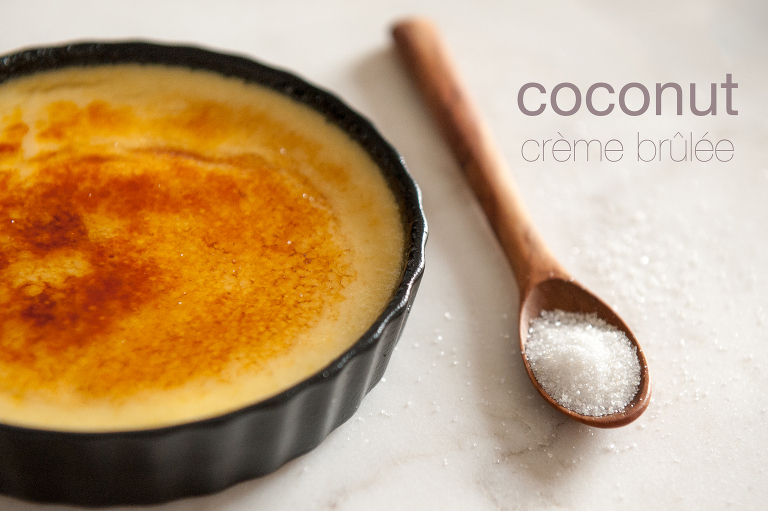 If you’re a fan of crème brûlée like me, how do you like yours? Thick crust vs thin? Heavy custard or light? Let me know in the comments! In a saucepan combine coconut milk, milk, sugar and salt and slowly stir over a medium low heat until the sugar dissolves. 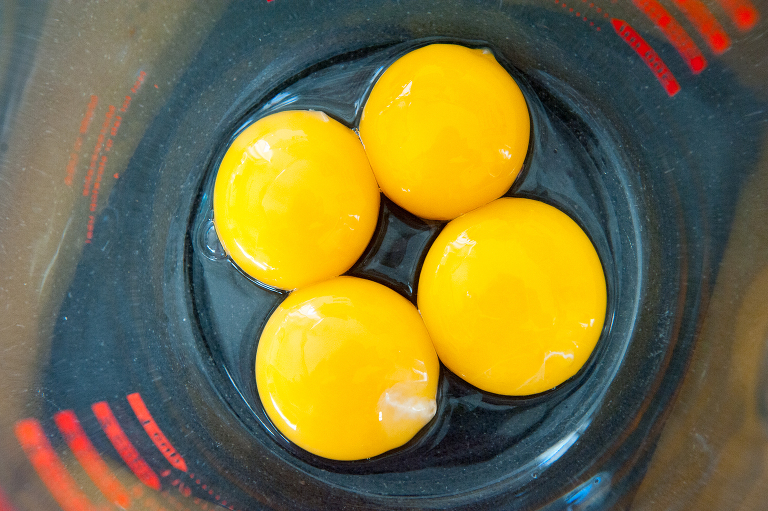 In a bowl (I recommend using a measuring cup with a spout for easy pouring) whisk together the 4 egg yolks and then slowly add the cream mixture (if it's too hot it'll cook the eggs so take your time) stirring slowly to avoid creating too many air bubbles until everything is homogenous. Place 4 gratin dishes into a tray with high sides. Divide the mixture into the gratin dishes and pour enough of your boiling water to reach half way up the sides of the gratin dishes to create a bain marie. Place in the oven and bake for 25 minutes or until the custards are just set. Remove from the oven and let them cool on a rack before placing them in the refrigerator to cool. 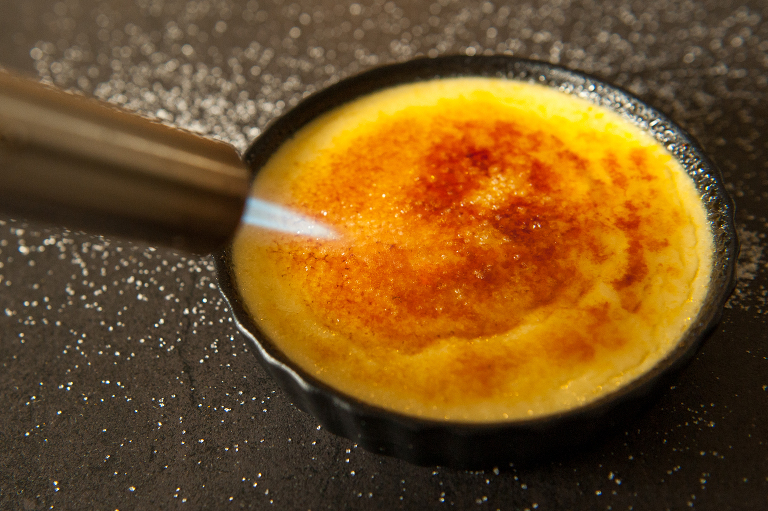 When you're ready to serve them, place a light coating of sugar on top of each custard and using a blow torch* melt the sugar until it caramelizes. If you don't have a blow torch you can still get a nice crust with the broiler in your oven. Place the rack nice and high and set it on full whack and ensure it's good and hot before you get started. 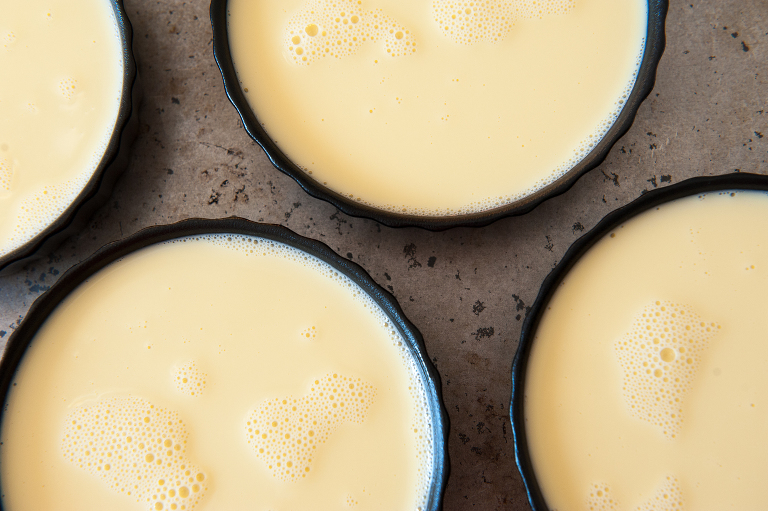 Ideally you'll want your custard to be really cold before you begin, overnight in the fridge if you can bear it. Then place them on a pan and under the broiler for 5-10 minutes. Stay close by, just in case, since every oven is different and if it blackens they'll become bitter. Serve immediately.